From time-to-time, I report the number of vehicle miles traveled in the USA. I do it because vehicle travel is one of the largest contributors to air pollution and greenhouse gas emissions. You can try to make vehicles cleaner, but the bottom line is that they require energy to operate, and that energy mostly comes from fossil fuel. The more miles traveled, the more sulfur dioxide, nitrogen oxides, particulate matter, ozone, and carbon dioxide get emitted into the atmosphere. Figure 1. Data source: Department of Transportation. For road planning purposes, the Department of Transportation estimates the number of vehicle miles traveled in the USA, and breaks it down by state. 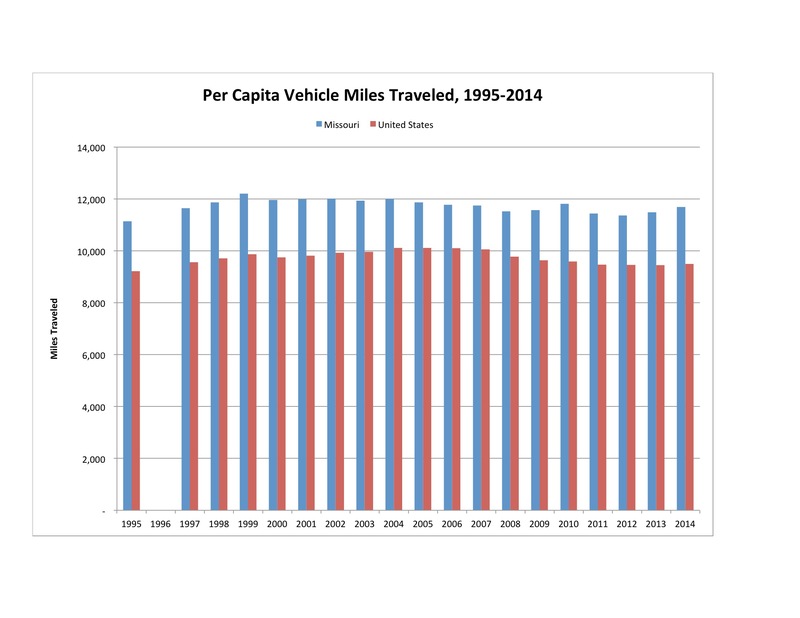 Figure 1 shows the total vehicle miles traveled in the United States from 1980 to 2014, the most recent year for which data is available. The blue portion of the columns represents rural miles traveled, while the red portion represents urban miles traveled. Total miles traveled increased rather steadily from 1980 until 2007, when the Great Recession began. They bottomed in 2009, and have resumed increasing unsteadily since then. They reached a new all-time high in 2014 of 3,025,656,000,000 miles. That’s 3 trillion miles. No wonder we create a lot of pollution and carbon dioxide! More than 2/3 of the miles are driven in urban areas. The slope of the increase since 2009 does not appear to be as steep as before 2007, however the country had not fully recovered from the recession in 2014, and the rate may have increased since then. We cannot know from this data. Figure 2. Data source: Department of Transportation. Figure 2 shows the data for Missouri. The data series only goes back to 1995, and data for 1996 is missing. 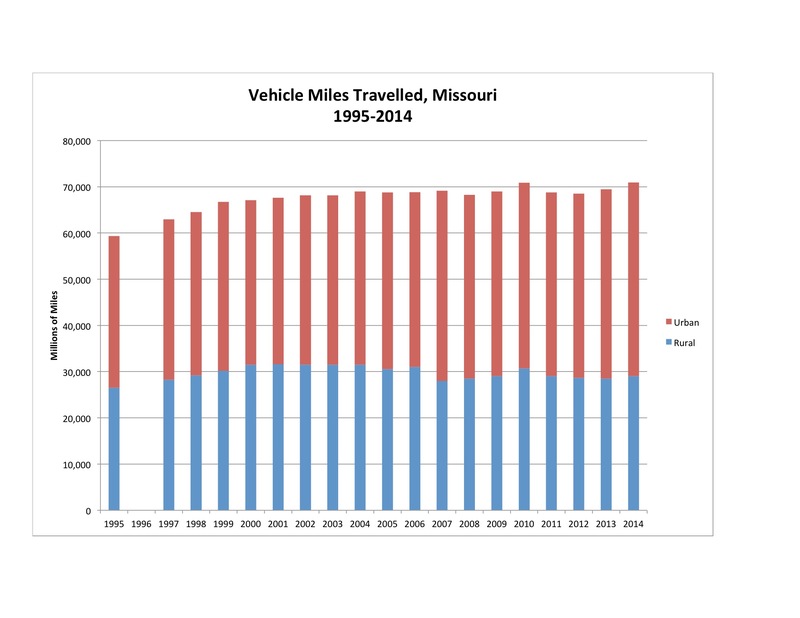 The miles driven in Missouri increased steadily until 2004, several years before the Great Recession. Since then it has slowly meandered up and down, peaking slightly higher at 41,901,000 miles in 2014. About 59% of the miles are driven in urban areas. Of course, the population of the country is steadily growing, and so is the economy. More people driving and more economic activity naturally translate into more driving, so how are vehicle miles driven changing on a per capita or per dollar of gross domestic product basis? Figure 3. Data source: Department of Transportation, Census Bureau. Figure 3 shows the per capita data. The red columns represent the USA, and the blue columns represent Missouri. The data goes back to 1995, but 1996 is missing. For both the USA and Missouri, vehicle miles driven have mostly meandered sideways. The number of miles driven in 2014 is about 3% higher than 1995 for the USA as a whole, and 5% higher for Missouri. Figure 4. Data source: Department of Transportation, Bureau of Economic Analysis, Federal Reserve Bank of St. Louis. 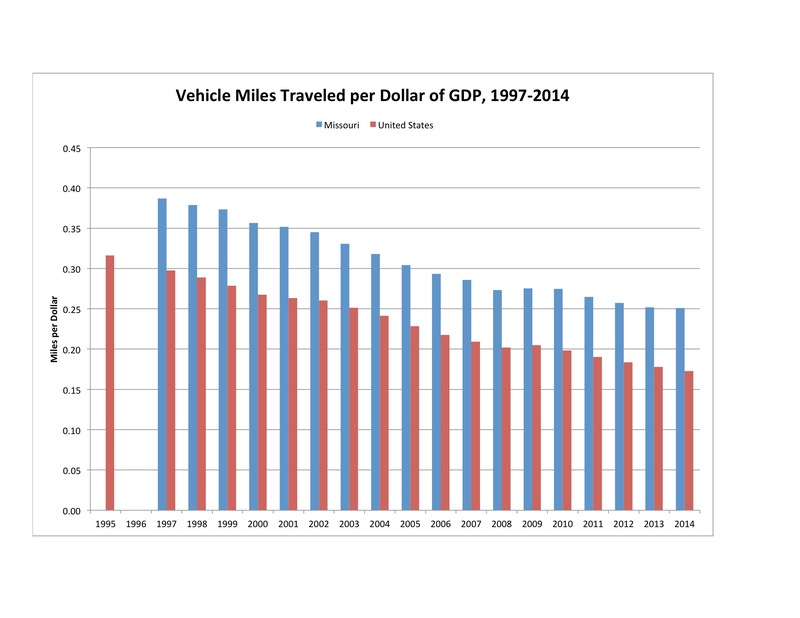 Figure 4 shows the number of vehicle miles traveled per dollar of gross domestic product. Red columns represent the USA and blue columns represent Missouri. Data for the USA extends back to 1995 (with 1996 missing), but data for Missouri only extends back to 1997. In both cases there is a clear trend: the number of vehicle miles traveled it takes to produce a dollar of gross domestic product has decreased. Nationwide, it has decreased from about 0.32 miles per dollar to about 0.17 miles. In Missouri, it has decreased from about 0.39 miles per dollar to about 0.25. Most economists view increases in vehicle miles traveled as a sign of economic growth, and they welcome it. But in addition, it is a cause of increased pollution. I have discussed over and over in this blog the problems created by air pollution and climate change. We simply must find a way to create economic well being without sickening the planet, and ourselves in along with it. We have not yet figured that out. 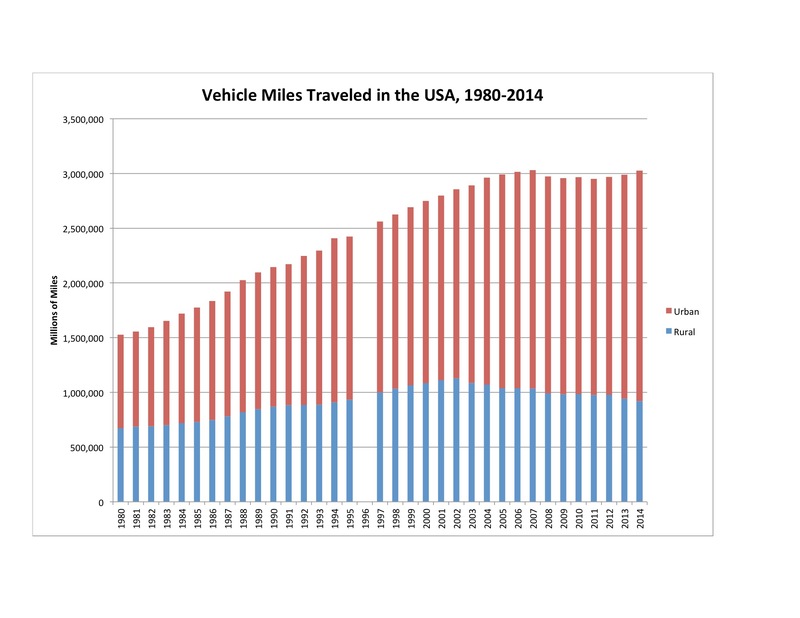 For VMT: Vehicle Miles Traveled in the USA, 1980-2011. Office of Highway Policy Information, Federal Highway Administration. http://www.fhwa.dot.gov/policyinformation/quickfinddata/qftravel.cfm. Estimated Missouri Population, 1960-1990. Census Bureau, Historical Data. http://www.census.gov/popest/data/historical/index.html. Monthly Estimates of the United States Population: April 1, 1980 to July 1, 1999, with Short-Term Projections to November 1, 2000. https://www.census.gov/popest/data/national/totals/1990s/tables/nat-total.txt. Table 1. Intercensal Estimates of the Resident Population for the United States, Regions, States, and Puerto Rico: April 1, 2000 to July 1, 2010. http://www.census.gov/popest/data/intercensal/national/nat2020.html. For Missouri GDP data: Total Gross Domestic Product by State for Missouri. Economic Research, Federal Reserve Bank of St. Louis. http://research.stlouisfed.org/fred2/series/MONGSP#. By mogreenstats in Energy on 2018/09/27 .